6/7/2010Share this story on Facebook! All brought to you by the Ithaca Downtown Alliance. Just as expected, the rain came down in the final hours of the weekend, as if to solidify an annual tradition of bad weather for Ithaca Festival. “Instead of hoping for good weather, Ithaca just decided to embrace the rain this year,” joked a local resident at this weekend’s "Singin' in the Rain themed festival". Students who leave in May from Ithaca College have a general idea that this summer gathering is well attended but often never see how important Ithaca Festival really is. The celebrations start Thursday afternoon with the Ithaca Festival Mile race and the parade, both unique to the town of Ithaca. For these festivities, imagine less marching bands and flower adorned floats and more the He Man Chainsaw Marching Band, local men and their kids banging on metal and revving hand-held chainsaws to make music, and the Volvo Ballet, featuring the towns favorite Volvo sedans and station wagons dressed (yes, the cars wore outfits) in tutu’s and tiaras accompanied by local dancers. After the opening night, events moved to the Commons for Friday and Saturday. Both days were filled with music, family activities, handmade jewelry and crafts and of course, delicious food. Though this year’s theme was "Singin’ in the Rain" weather gave the festival lots of sunshine and about ninety degrees of summer heat. Highlights of the festival included the music pavilions, a family magic show and the “Physics Phun” stand where kids could experiment and learn about science. The weather didn’t hold out for the entire weekend and as Sunday came and the festival neared its end, the rain started to drizzle. Still hundreds of people biked, took the TCAT and walked to Stewart Park for the final day of Ithaca fun. Children played on the park’s playgrounds while everyone else could take time to relax and even get a message at the Healing Arts Fair or learn how to green their homes, cars and eating practices at the Gorges Green Expo. “The wind came in this morning and some of the craft’s the vendor’s left” said a local jewelry designer, but a drop in temperature and a few rain drops only added to the fun, and unpredictability of this year’s Ithaca Festival. 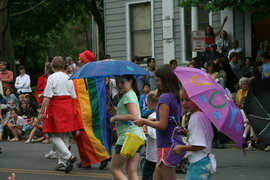 For more information on the weekend's activities see the official Ithaca Festival website.